Together with a steel engraved portrait. ALS. 1p. R[oyal] Institution. April 5th 1833. To the Egyptologist T[homas] J[oseph] Pettigrew. "My dear Sir, I am very much indebted to you for your kind invitation. But I fear I shall not be able to be with you. If I can escape from the Institution on Saturday it must be to witness some experiments on the traction of boats on canals. Yours faithfully, M. Faraday." 8vo. Approx 7.25 x 4.5 inches (18.5 x 11.5 cms). 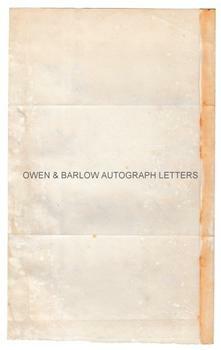 Old folds and creases, some browning. The blank leaf of the bifolium excised to a stub which had previously been used for mounting purposes. Mounting traces to verso. All else very good. The steel engraved portrait is after a painting by Pickersgill and was published in London by Fisher & Son in 1846. The engraving measures approx. 6 x 3.5 inches. It has been cropped at edges and has some foxing and mounting residue to verso of corners. 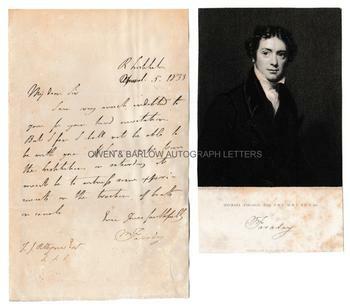 Michael Faraday had become professor of Chemistry at the Royal Institution in 1833, the year of this letter, and was heavily engaged in his experiments into electromagnetism. 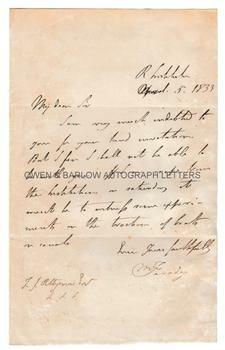 It is possible that the traction MICHAEL FARADAY refers to in this letter concerned experiments into using locomotive power and ropes to tow canal boats. Thomas Joseph Pettigrew (1791-1865), known as "Mummy" Pettigrew, was a surgeon and antiquarian, a pioneer Egyptologist and a specialist in Egyptian mummies. He was well-known in Georgian and Victorian intellectual circles and was a regular correspondent with Charles Dickens, Astley Paston Cooper and Michael Faraday. He gave several talks on mummies, sometimes including a demonstration in which these were unwrapped before the audience. In 1834 he published his seminal work 'The History of Egyptian Mummies'. Around this time he gave several lectures to the members of the Royal Institution (the oldest society in the world that is dedicated to scientific research and education). Provenance: From the 19th century album compiled by the family of Dr James Copland FRS (1791-1870), the Scottish physician and medical writer.